"Oh my that's got to hurt." The above info came from Mastero, and was edited by yours truly (contact me). Power, cunning, henchmen, fangs, and by god what a snappy dresser he is. Myotismon is without a doubt the most evil and one of the strongest villains ever to curse any world. A ruthless vampire king with Digimon attacks strong enough to cripple any creature. Myotismon arrived in a sea of bats, giving orders to his bumbling henchmen DemiDevimon. Not much is known about his past. When Gatomon was still Salamon, she ran across Myotismon who punished her for looking at him with "those eyes". Eventually, Myotismon beat her enough to make her his slave as she became Gatomon. Personality wise, Myotismon is not one who is easily rattled. Myotismon talks big and plans big, and has the power to back up his talk. Using human blood to keep himself life, Myotismon works in secrecy and prefers solitude than anyone else's company. Ever since he first appeared, Myotismon has never cared about ruling the Digiworld, as he has always longed for the Real world. When the Digidestined crests began to glow, Myotismon escaped into the real world through a dark gate to find the 8th child, Kari. Eventually, Myotismon caught Kari and her Digimon, Gatomon. During a long and very hard battle, Wizardmon was killed by Myotismon, giving his life up to save Kari and Gatomon. This caused Gatomon to become Angewoman and supposedly kill Myotismon for good. But he came back as a giant monster called VenomMyotismon and killed DemiDevimon. The Digidestined and their Mega Digimon eventually killed VenomMyotismon seemingly for good. Yet again Myotismon was later to be revealed as the mastermind behind the Season 02 master plan. He hid in Oikawa's body as a spirit until he was strong enough to transform into MaloMyotismon. But his new powers and abilities were unable to fool the new Digidestined, and he was finally destroyed once and for all by the power of every Digidestined on Earth. The above description came from Nukem, and was edited by yours truly (contact me). Vandemon is a demonic un-dead Digimon at the perfect (Dub: Ultimate) level. His attacks include Bloody Stream (Dub: Crimson Lightning) attack. When he uses this attack his blood comes out of his wrists and becomes solid so he can use it in a whip like fashion. His next attack is Night Raid (Dub: Grisly Wing) where he sends a wave of darkness followed by a small swarm of evil bats at his enemy. His final attack is Dead Scream (Dub: Nightmare Claw) where is paralyzes his by touching them with his hand. 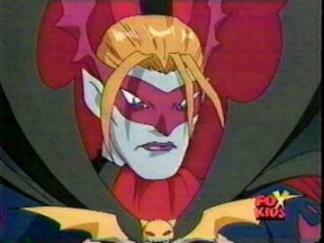 Vandemon is first introduced in the third saga of the first season of Digimon. He sends Picodevimon (Demidevimon) To make certain that the Chosen Children's crests don't glow. However Picodevimon fails time and time again despite how much Vandemon tortured him for his failures. Vandemon eventfully confronts the Chosen Children himself however Sora's crest of love glowed when she was protecting Piyomon causing the Digimon to evolve all the way to perfect level Garudamon. Garudamon was able to inflict enough damage on him for the chosen children to retreat. Vandemon later enters the real world through an gate once he figures out the secret cards that were needed to active it. With him he brought along several Digimon that work with him, among these was included Picodevimon, Tailmon (Dub: Gatomon), Phantomon and Wizarmon (Dub: Wizardmon). He came to the real world to kill the eighth chosen child who was prophesied to be the one to kill him. He made copies of the crest of light that belonged to the eighth chosen child and distributed them to all of his minions. The crests would glow of the eighth child was nearby. Two of Vandemon's lackeys, Pumpmon (Dub: Pumpkinmon) and Gotsumon were sent out to look for the eighth chosen child like all of Vandemon's other minions. However they ignored what he said and just wanted to have fun. They encountered Yamato (Dub: Matt), Takeru (Dub: Tk), and Gabumon while they were searching for Patamon. Pumpmon and Gotsumon continuously got into trouble doing things like stealing ice cream and trying to pull some girls nose ring out then would run when trouble started. Vandemon came to them when he saw that they were goofing off and ordered them to kill Yamato and Takeru. They did chase them a while but the second they thought that they were out of Vandemon's site they stopped. However Vandemon did see and he killed them both with his Night Raid attack. This caused Yamato's crest of friendship to glow causing Gabumon to evolve all the way to Weregarurumon to fight Vandemon. Vandemon gained the upper hand until Patamon showed up and evolved into Angemon forcing Vandemon to retreat. Tailmon and Wizarmon betray Vandemon when Tailmon finds sees how kind Hikari (Dub: Kari) is to her and finds out that she is her Digimon and that Hikari is the eighth chosen child. Vandemon captures Tailmon and throws Wizarmon into the ocean. Wizarmon is later rescued by Jyou (Dub: Joe) and Zudomon. Vandemon then realized that Wizarmon had taken the Crest of Light from him during their battle. Vandemon makes another appearance when Togemon super evolved into Lillymon and beat Darktyrannomon he easily beats Lillymon and uses his Dead Scream attack to disable her. Birdramon saves Lillymon before he can finish her off. Phantomon and two of his lackeys defeat Yamato, Sora, Garudamon, and Weregarurumon. However Hikari offers to give herself up if he spared them. Phantomon agreed and strangely enough actually kept his word. He brought Hikari to Vandemon. The Chosen Children all rally together and attack the building Vandemon had fortified as his base in an attempt to save Hikari and Tailmon. During the battle, Vandemon fired his Night Raid attack at Hikari, but Wizarmon jumped in it's path taking the blow instead. The damage proved to be fatal to Wizarmon. Hikari claimed the Crest of Light causing Tailmon to super evolve into Angewomon. Angewomon used her Heaven's Charm attack to disable Vandemon then all of the chosen children's Digimon gave some of their powers to Angewomon to super charge her Holy Arrow (Dub: Celestial Arrow) and fired it at Vandemon. The Vampire Demon Digimon was seemingly destroyed. However at six minutes and six seconds after six o'clock he reconfigured himself as an Ultimate (Dub: Mega) level Digimon known as Venomvandemon (Dub: Venomyotismon). Venomvandemon was a huge Digimon that was several stories tall and his attacks included Venom Infuse, deadly beams of energy fired from his eyes and Chaos Flame, fireballs shot from the creature in his abdomen. He ate Picodevimon because Picodevimon was annoying him, and he begun to head towards the convention center, where all of the people he had captured were still in his trance. He planned on devouring them for energy. Angemon and Angewomon confronted him but were not powerful enough to stop him. Recalling from the prophecy Koushirou (Dub: Izzy) figured out how to warp evolve Agumon and Gabumon to Wargreymon and Metalgarurumon. However even they were not powerful enough to beat Venomvandemon. The Chosen Children's crests then begun to glow and they help Venomvandemon in place. They realized that the creature inside his abdomen was his true form and they destroyed it which in turn destroyed Venomvandemon's body. But this was not the end. Vandemon's spirit survived and it entered the body of a man known as Oikawa. It poisoned his mind and used his desire to reach the Digital World to manipulate him. He manipulated Ken into becoming the Digimon Kaiser (Dub: Digimon Emperor) and created two Digimon to serve him. They were Archnemon (Dub: Arukenimon) and Mummymon. Even after the Digimon Kaiser's fall Archnemon could morph the Dark Towers (Dub: Control Spires) that he had set up into fake Digimon. Oikawa then captured Ken and copies the Dark Spore and transferred the copies into other children. When Blackwargreymon confronted Oikawa Vandemon's powers manifested and fatality wounded Blackwargreymon. Oikawa continued with his plans and used the Dark Spore Children to enter the digital world. However all did not go as Oikawa planned. He had not been aware that Blackwargreymon had used the last of his life force to steal the digital gate. They where transported to a strange dimension that they had never seen before. Also the second generation chosen children had gotten through the gate before it closed. Vandemon explained to Oikawa that he had been manipulating him and tore out of his body fatally wounding him. He ordered Archnemon and Mummymon to distract the chosen children while he absorbed the energy from the dark spores. Once he had done this he transformed into Belialvamdemon (Dub: Malomyotismon). In this alternate ultimate form his attacks were Melting Blood (Dub: Crimson Mist). In this attack he sent fired blood at his enemy that was so heated it actually could melt just about anything. And his second attack is Pandemonium Flare (Dub: Screaming Darkness) where he either sends balls of darkness at his enemies or sends waves of darkness in every direction. He also has a Mind Illusion ability that would create an illusion in someone's mind that they would have what they most wanted. He killed both Archnemon and Mummymon to feed off of their fears. Seeing his power and cruelty, most of the second generation chosen children became scared except for Daisuke (Dub: Davis). He sent his Digimon XV-mon (Dub: Exveemon) to battle Belialvamdemon. The dimension granted XV-mon extra power to battle Belialvamdemon with. Not wanting to waste anymore time, he used his Mind Illusion on the chosen children. However, Daisuke didn't have any worldly wants making him immune to the illusion. Daisuke went into the other children's illusions and brought them back to reality. He also used the dimensions powers to evolve V-mon (Dub: Veemon) into all of his evolutions at once. The other chosen children did the same, and Belialvamdemon found himself faced with an entire army. When Imperialdramon and Imperialdramon Fighter Mode blasted him through the dimensional wall into the digital world, the Digimon tried to follow, but when they did all of the copies vanished leaving only Imperialdramon Fighter Mode, Silphymon, and Shakkoumon. Also, Belialvamdemon became even more powerful. Belialvamdemon opened a portal to the real world and begun covering it in darkness. The three fused Digimon tried to stop him, but he proved too powerful form them. However, the chosen children around the world cut through the blanket of darkness that Belialvamdemon had created and brought them and their Digimon to the digital world. The light of the Digivices weakened Belialvamdemon, but when the dark spore children begun to drought themselves Belialvamdemon fed on this drought and it begun to power him up. Acting quickly, Daisuke and some of the other chosen children gave a pep talk to the children infected with the dark spores, getting them out of their little depression. With no source of energy left Belialvamdemon's body was destroyed. His spirit flew into the air, but before it could do anything all of the chosen children sent some of the power of their Digivices to Imperialdramon Fighter Mode and it formed a giant cannon. Imperialdramon Fighter Mode used this cannon firing it's Giga Death (Dub: Giga Crusher) attack at Vandemon's spirit finishing him once and for all. The above description came from Mastero, and was edited by yours truly (contact me).